Occipital neuralgia is the irritation of one of the nerves that provide feeling in the back and top of the head. Most of the feeling in this area is transmitted to the brain by the two greater occipital nerves, with one nerve on each side of the head. Emerging from between cervical vertebrate, the two occipital nerves make their way through muscles at the back of the head and into the scalp. The nerves may reach almost to the forehead, but they do not cover the face or the area near the ears. Irritation of one these nerves anywhere along their course can cause a shooting, zapping, electric, or tingling pain with symptoms located on one side of the scalp. Sometimes the pain can also seem to radiate toward one eye. For some, the scalp becomes extremely sensitive to even the lightest touch, making washing the hair or lying on a pillow nearly impossible. For others, there may be numbness in the affected area. The region where the nerves enter the scalp may be extremely tender. True isolated occipital neuralgia is actually quite rare. However many other types of headaches – especially migraines – can predominately or repeatedly involve the back of the head on the one particular side, inflaming the greater occipital nerve on the involved side and causing confusion as to the actual diagnosis. Sometimes “tight” muscles at the back of the head can entrap the nerves. 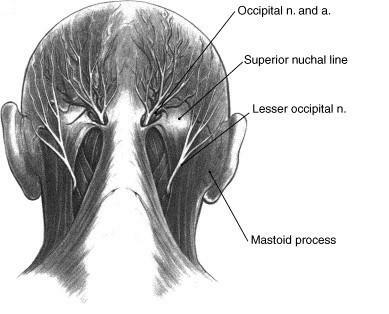 Occipital neuralgia can be diagnosed by an occipital nerve block, which is an injection of a steroid or other medication around the occipital nerves. The steroid injected reduces inflammation and swelling of tissue around the occipital nerves. This in turn reduces pain and other symptoms caused by inflammation or irritation of the nerves and surrounding structures. The effects of the nerve block can last several weeks to several months, and then would need to be repeated. For patients who do well with this temporary deadening of the nerve, more permanent procedures are available. These include cutting the nerve surgically; “burning” the nerve with a radio-wave probe; eliminating the nerve with a small dose of an injected toxin; a surgeon could decompress the nerve by removing any impinging muscles or scar tissue; or an occipital nerve stimulator (a pacemaker-like device that stimulates the nerve with electricity resulting in tingling rather than pain) could be implanted. Obviously any procedure that deadens the nerve permanently is likely to leave some degree of permanent numbness in the scalp. If a patient’s pain does not reliably improve with occipital nerve blocks, it is not recommend proceeding with any of the more drastic measures. Because all of these procedures are invasive, carrying some degree of risk of permanent complication, generally the first step is to try using medications to relax the over-active nerves. Some patients respond well to non-invasive therapy. If you continue to suffer with occipital neuralgia and your current treatment plan leaves you feeling hopeless, perhaps a fresh set of experienced eyes can change your outlook. Since 1990, Dennis M. Lox, M.D has applied his personal interests in sports medicine, cutting-edge regenerative medicine and chronic pain management to helping patients increase their quality of life. Contact us for an appointment at 727-462-5582. Dennis M. Lox, MD, and the Florida Spine Center serve patients within the greater Tampa Bay area, including Clearwater, Tampa and St. Petersburg, as well as all of Florida and the US.